Can’t disclose how it will work. But early tests indicate that if you take a reasonable sized RAR archive compressed to the max and place it in my container, you should expect to achieve a further 15-17% compression. Now the plan is to finish the library and post the service as a website where you can compress and uncompress a single file. I will probably put a limit on the file around 50 Mb mark. This will allow me to gather vital statistics (without killing my server). BZip2 is yet another data compression algorithm, similar to GZip and Deflate. 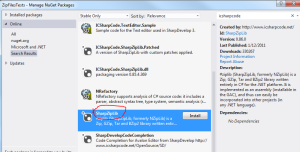 There’s no native support for BZip2 (de)compression in .NET but there’s a NuGet package provided by icsharpcode.net.